A suspect abandoned a vehicle under the 5 Freeway at Hollywood Way and fled on foot following a chase in a stolen vehicle. NORTH HOLLYWOOD, LOS ANGELES -- Minutes after one chase ended in the San Fernando Valley, another one began - and a third - this time for an allegedly stolen vehicle in the North Hollywood area. The chase began around 9:30 p.m., heading first northbound on the 170 Freeway from the Victory Boulevard onramp, then exiting onto Sherman Way. 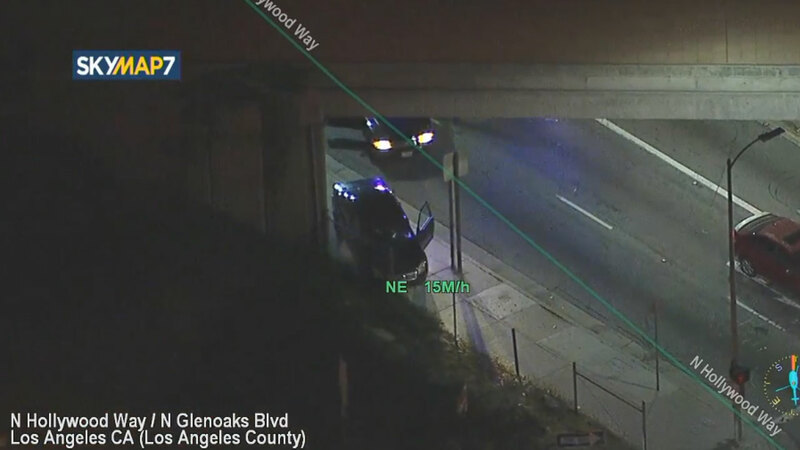 As police followed, the black sedan drove around the North Hollywood-Van Nuys area on surface streets and the 5 Freeway at speeds over 100 mph. After a few minutes, the car pulled under a 5 Freeway overpass at Hollywood Way and the driver apparently fled on foot. Police started looking for him in the neighborhood. Soon after that pursuit ended, another began of a black F-150 pickup truck that quickly got onto the 101 Freeway heading north. Early indications were that the truck may have been carjacked by the suspect who fled the black sedan. Earlier, when the suspects were still in the sedan, the vehicle was seen pulling over in a residential neighborhood. The male driver exited and a woman passenger also exited and walked calmly away. The driver then jumped back in the vehicle on the passenger side and continued fleeing from police.